For one last time, I shall be using the old NOAH logo as a featured image for a piece here on The Indy Corner, NOAH recently in February changed ownership to LIDET, who aim to bring NOAH back up to the number 2 spot in Japan within 3 years, as was recently reported in Puroresu Weekly in Japan and translated by Hisame. I was happy initially with the news of the new owners who had cash, who had experience with wrestling but one of the first items of news I heard regarding their intentions was the removal of the legendary green canvas, on March 3rd in Shimizu, on the final night of the Navigation for the Progress tour, NOAH and its wrestlers said farewell to the famous green. Its not for good as it will be used for Misawa Memorial shows and such, but this was a big blow for me to digest, and perhaps many others, with memories of Misawa vs Kobashi flooding back, that happened in the presence of that sacred colour, I took it hard at first. 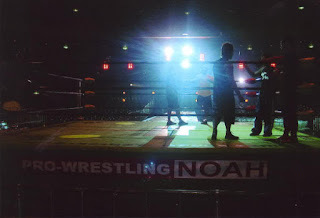 As the lights in Shimizu faded on that sacred green canvas, NOAH, its staff and fans said farewell to it and by now I had come to understand a few things in regards to LIDET and in regards to NOAH itself in recent years, particularly through its struggles and failed relationship with New Japan. When I see that green ring, I instantly think of Misawa, his legacy and his unfortunate death, that green is loaded with both joyous emotion and sadness. I cannot begrudge LIDET for wanting to create a new era, a new legacy for them with NOAH, after all, much of last year was made up of those that knew Misawa warring with the Mid-Generation and the Younger Generation who perhaps did not know the legendary figure at all, Kenoh was the first GHC Heavyweight to have never known Mitsuharu Misawa. The shift towards a new era, away from the older era was already occuring, it has just been accelareted in the last month. The legacy of Misawa will never fade, we will always remember him fondly. Many of the generation that knew him are still with the company, and I imagine they’ll be reminding people of the ethos of which the founder had envisaged while they move towards their future. This morning, I awoke to a Twitter timeline, divided on feelings towards another change, the reveal of the new logo, I personally don’t mind it, it is quite muted in its minimalism yet it is modern and fresh. On its own, it can be quite underwhelming, but I have since seen the new merchandise with the new logo, and posters with it and it looks very appealing and striking. This is truly a dawning of a new era for the promotion, and perhaps this fresh start, this reset is what the company needs after the turbulent years of the dark days, last year was very good but now their is a solid financial footing which can allow NOAH to grow again. I will continue to support the company as it continues on its quest to become a force in Puroresu again, after all they still have Kenoh, Nakajima, Shiozaki, Harada, Kaito Kiyomiya as well as some older and more familiar faces to older fans who may have lapsed like Marufuji, Ogawa, Saito and Sugiura. With Great Voyage in Yokohama around the corner on the 10th, as the old guard of Marufuji challenges the youngster Kiyomiya, there is no better time to come into NOAH, for new fans, it can be a new beginning for you and perhaps for fans who have ventured off, perhaps this time is a good time to return. Overall, I’m excited and a look forward to witnessing what the future unfolds for NOAH. Forever consumed, enchanted, enthralled, and possessed by emerald spirits.